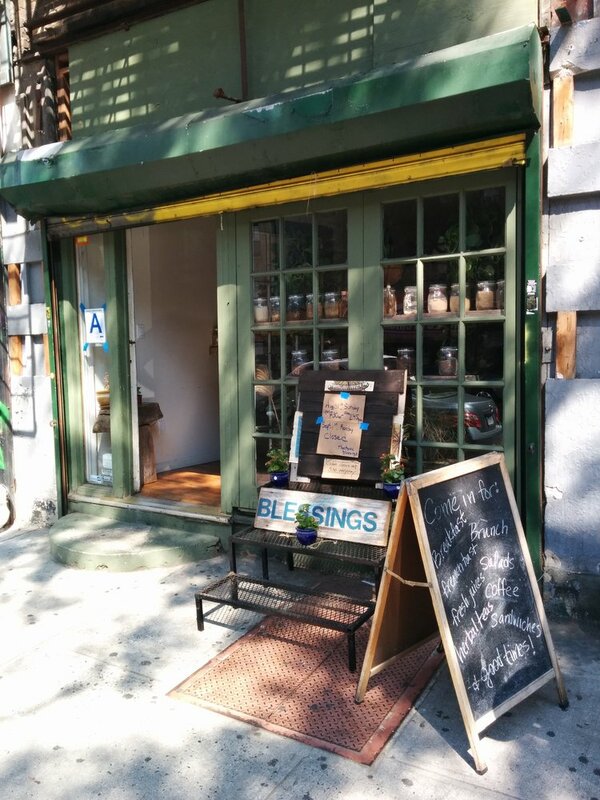 Squeezed between a tattoo parlor and residential walk-up, Blessings Herbs & Coffee is easy to miss when walking down Flatbush Ave. 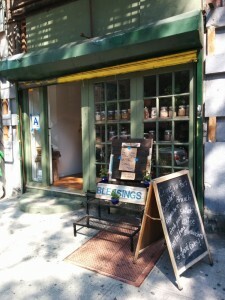 Dozens of potted greens adorn the shop window, providing an obscure view into what looks like a dimly-lit café. Step through the creaking door of Blessings and enter home – where home consists of mismatched chairs, exposed bricks, book collector’s paraphernalia, and a half kitchen serving up hearty meals. Its rustic charm with live jazz make up the perfect idyllic ambiance where one can lounge and sip barista-crafted lattes all day. Blessings Herbs & Coffee is also a great brunch place to alleviate a raging hangover – their small but hearty menu offers rich breakfast platters, quinoa salad, prosciutto, salmon, and super fluffy French toasts. 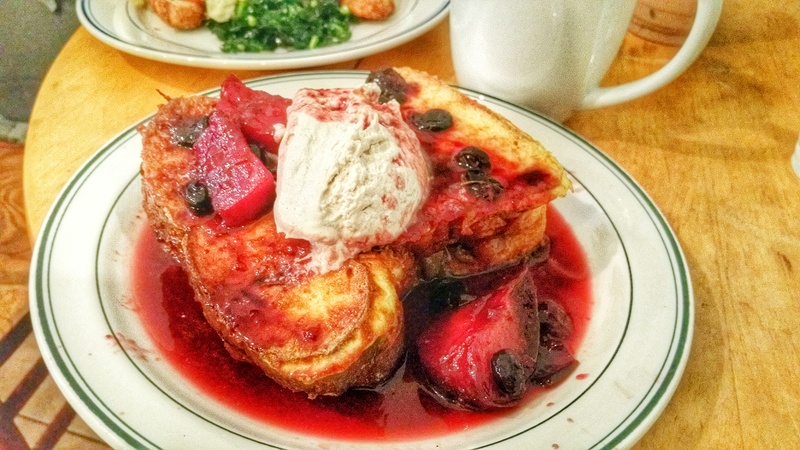 For sweet tooths, their banana foster French toast is recommended, which is topped with fresh strawberries and cream and marinated in its candied juices. 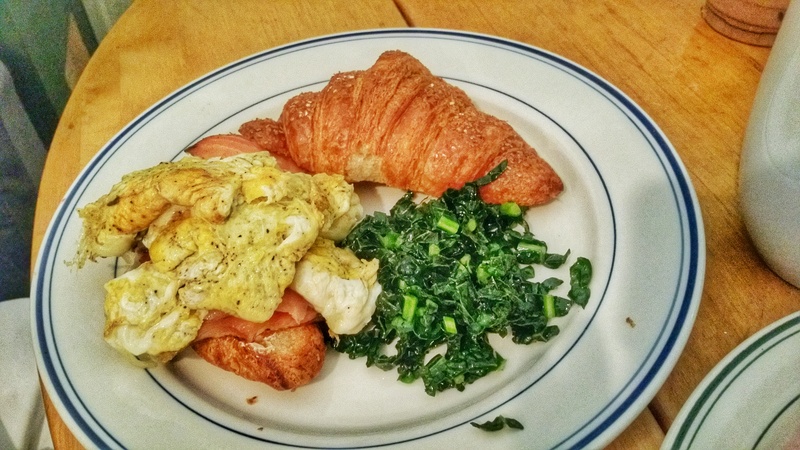 For those seeking a well-rounded meal, one can’t go wrong with their breakfast platter or their number one seller: salmon pastrami croissant coupled with greens. The name alone is a tasty mouthful. Like its appearance, the experience is super casual. 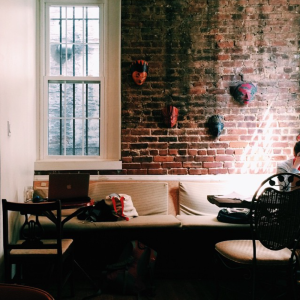 You walk in, grab a table, couch, or a desk. If out of seats, you grab a chair from the corner. Then you order from the kitchen bar, picking from a menu that is updated daily in chalk. The barista busily crafts caffeinated drinks, the owner takes orders, and two cooks fire up smoke behind them; the aroma of bacon, sauteed greens (vegan friendly! ), and sweet sauces wafting around you. There’s a mini library of ancient classics like the translated texts of the Code of Bushido, religious texts, Indian herbology textbooks, and other much bethumbed reads. You could enjoy any of their collected books, while sipping your cold brew and waiting for your delicious platter to be called. There’s no time limit to your stay and there’s no limit to your relaxation in this brunch lounge. Stumbled upon on a dreary, hungover day, this place is truly a Blessing in disguise.